This neat little circuit can play 8 note tunes at any speed you want. You select the notes with 8 trim pots. The speed in selected through a ninth pot. The circuit draws very little power and can be powered by a 9 volt battery, with the addition of a 7805 regulator to power the TTL logic used. R1 controls the speed at which the notes are played. R3-R10 control the pitch of those notes. The circuit will operate fine on a 9V battery, with the addition of a 7805 regulator to power the TTL logic used. The missing pin on U2 is pin 14. Unfortunately the LM3909 is no longer manufactured. It's easy to redesign the circuit with a NE556 in place of U1 and U8. There are better ways to do this. You could replace all those ICs with a single microcontroller, such as the PIC12F508 or a melody generator IC such as the UM66 or M66T. I don't see what's so hard to understand here: the first stage, the 555 timer, determines the tempo, bpm, or speed of the song. Trimpot R1 is used to adjust this speed. The clock from the 555 timer is put into a timer, which simply counts (so your song is in order). You don't touch anything there. Lastly, resistors R3-R10 control the frequency for each note in the song. The circuit first looks at R3, and plays a note based on its resistance (how far it's spun). It moves on to R4, until it reaches R10 and comes back at the beginning. Hope that helps. PS: You could replace 4016 with transistors, correct? can you describe the 8note and how can we serch it? do the 8 tones/pitches/notes play in sequential order dictated by the number pots? For example. R3 for 1/4 note ,R4 for a 1/4 note, R5 for a 1/4 note, and so on? Although I'm not new to music or music theory...I am new to circuit building. thanks! 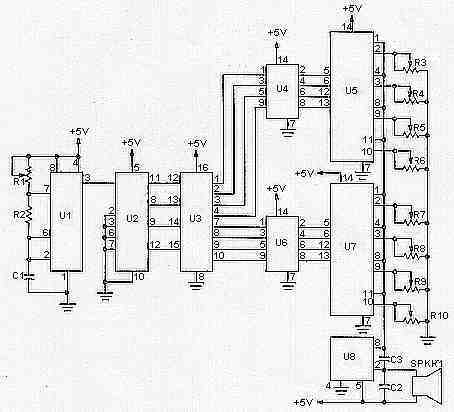 Dear sir: I am building the 8 note tune player, have found that the 3909 led oscillator is obsolete, I was told to use a 555 timer for amplification could you tell me how the wiring should be? having some problems figuring out, your response would be appreciated asap.